Railpictures.ca - Dave Burroughs Photo: CN 5035 is still relatively clean albeit a recent addition to CN’s roster. 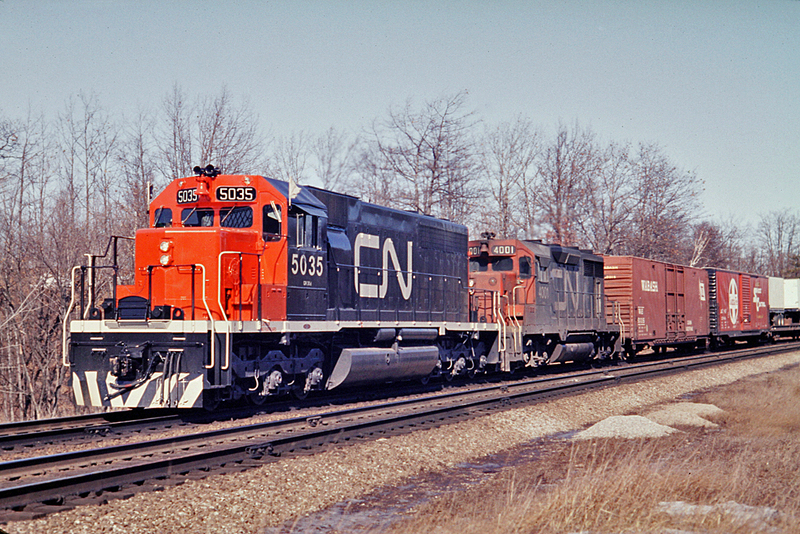 The trailing unit, 4001 is one of two CN GP35′s built in 1964 to grace CN rails. | Railpictures.ca – Canadian Railway Photography – photographie ferroviaire Canadienne. Caption: CN 5035 is still relatively clean albeit a recent addition to CN's roster. The trailing unit, 4001 is one of two CN GP35's built in 1964 to grace CN rails. Well, I did post a pic of 1-1/2 5000′s. Thanks for the memories! In 1968 it did not get any better than this, except perhaps, if you had two 5000s.